On “Love ShAck, Baby,” the Liars work hard to decipher Ali’s coded diary and get to Ali before A has a chance to stop them. What is going on with Pretty Little Liars? Aria is getting involved with Ezra again, and he’s listening to audio of Alison asking someone to help her escape and become someone else. Top it off with Aria’s ridiculous getup of sleeveless black T-shirt and leopard stretch pants, and I have to wonder what universe we’re watching. Emily dreams about Ali coming to her room to remind her how much she loved her. But she doesn’t know if it was a dream or reality. She later gets a note from Ali to meet her because she wants to come home. Hanna tells the Liars she and Caleb broke up because they needed to make an emotional clean break. Spencer finds her mother talking to Mrs. DiLaurentis in their kitchen about her getting a divorce, after he banned Spencer from speaking to her. Travis shows up at the cabin for a rescue just after the girls are spooked by A. After an argument with her father, Spencer decides to move in with Toby for a bit. Ezra is getting extremely bold and taking chances, which means the girls must be getting too close for comfort. 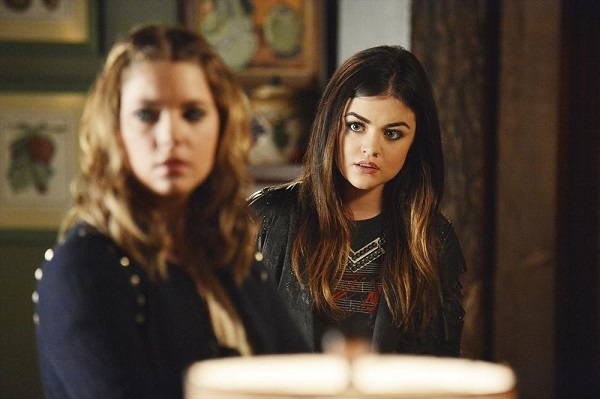 The purse Ezra was dumping in the preview was Hanna’s. He got into her room when he knew the girls were on a road trip, and he made up an excuse about her poor grades to talk to Ashley. How he knew Ashley would be called away long enough for him to rummage through the house is anybody’s guess. As the Liars tried to reach Ali (God knows why), they read through Ali’s diary, trying to determine which made-up name in her diary referred to which of them. Aria was Suzy Clueless, and Hanna was Cradle Robber because she hooked up with Aria’s brother, Mike. When she was heavy, she hooked up with him, and Ali berated her, made her feel like crap and told Hanna that Aria would never forgive her. The timing of finding it in the diary, just after Caleb broke up with her, was too much for Hanna. She thinks he dumped her because he found someone else and she wasn’t good enough for him. That’s what a lack of communication gets you — complete and utter misunderstanding. Seeing Travis during the hour was certainly no coincidence. Ali egged Hanna on by saying it would take her a long time to ever find someone to love her. So for Travis to be interested in her — even if it’s only as a friend (which I doubt) — might seem too soon on the outside, but with the confluence of the breakup and the return of Ali, it’s exactly what she needs. Is anyone else confused as to why Mr. Hastings is so angry about Spencer talking to Mrs. D? What might she tell her? Also confusing is why Toby wants his mother’s death to be ruled a murder. Anything other than suicide seems like a win at this point. What was that recording Ezra was listening to, and how did he get it? He seems to be getting more careless the more the Liars know. Do you think he has a new member of the A team working with him, or did he carry out everything alone? Despite all of the girls being present, this felt like Hanna’s episode, and Ashley Benson was at her best.